It’s 2016 and I’m excited to greet the New Year! Once the Holiday haze clears from our minds, we enter one of my favorite times of year at work. Winter is the time when the most serious buyers and sellers emerge – ready to greet the future. I often get asked for predictions on what the New Year will bring for my customers. I’m happy to say that everything I see coming in my crystal ball is wonderful news! What Does 2016 Hold for New Jersey Home Sellers? 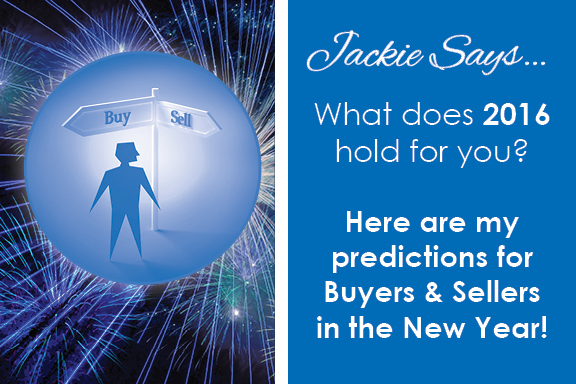 Sellers – if you’ve been waiting for the right time to list your home, I think you’ll find that 2016 is IT! This isn’t just a hunch based on long experience. The stats are in and they all show growing demand for home right in this area. According to the Otteau Group, the demand for NJ houses has been rising for 14 straight months, which has resulted in an anemic supply of homes. In Morris County, we only have a 6 month supply, which is considered very low. A normal supply would be enough to keep buyers busy for 8-9 months. In real numbers, our October statewide inventory of homes was down by 1,300 homes compared to the previous year. Our market is rising steadily, but the main drain on our growth is as simple as there being too few homes and plenty of buyers. As problems go, that’s not too bad! It creates the kind of seller friendly market that cautious homeowners have been hoping for! So what about underwater loans? We haven’t heard nearly as much about them lately, but many homeowners fear that they still owe more than the value of their homes. This fear is unfounded. Nationwide, home equity has nearly doubled since the worst days of the downturn, and is actually returning to levels we haven;t seen in a decade. Corelogic reports that only 8.7% of loans nationwide are for more than the value of the home. For comparison, 4 years ago a whopping 21% of home loans were underwater. Our area is particularly healthy compared to other parts of the country. In the NY/NJ area, 94.3% of home have positive equity, which is 2.3% above the national average! The real problem here is fear, and I’m here to tell you that there’s nothing to be afraid of. If you want concrete answers about the value of your home, please give me a call and I’ll be happy to give you a run-down on its value backed up by hard facts and 30 years of experience. Never let worrying drag you down. What Does 2016 Hold for New Jersey Home Buyers? What about today’s buyers? What kind of market can they expect in 2016? Fortunately, they’re in luck. The economy is strong in all the ways that make buying easier. Income is up nationwide, unemployment has dropped and interest rates are still better than we could have imagined a decade ago. While home prices are rising and homeowners have recovered their equity, there’s still lots of room to grow for years to come. The slow, but steady, pace of this recovery is healthy, sustainable and leaves plenty of room for new homeowners to see their purchase pay off in the future. Growth is expected to continue well into the 2020s at least! Rising rents will make homeownership especially attractive to many younger buyers who’ve been establishing themselves financially as adults in the past decade. These buyers-to-be have already seen what happens in a massive economic downturn and they understand the consequences of owning a home. A Trulia poll shows that 31% of Millenials want to buy a home in the next 2 years, and now that the job market has improved, they are in a much stronger position to follow through with that dream. Additionally, Fannie Mae and Freddic Mac each have low down payment programs designed to make buying easier for first time buyers with good credit. There’s also a lot of room to grow for remodelers due to emerging home trends. Niche markets have developed in eco-friendly home improvements, improved air quality and home automation. Remodelers are also seeing a vast expansion in “aging in place” remodels. As Baby Boomers age, they’re eager to get the most out of their homes for many years to come. I’d encourage anyone handy to look into expanding these skill-sets for a future-proof forward thinking career trajectory.